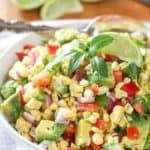 Fresh Corn Salad with Avocado – A no cook crunchy, big flavored salad. Served with a super quick Honey Lime Vinaigrette! 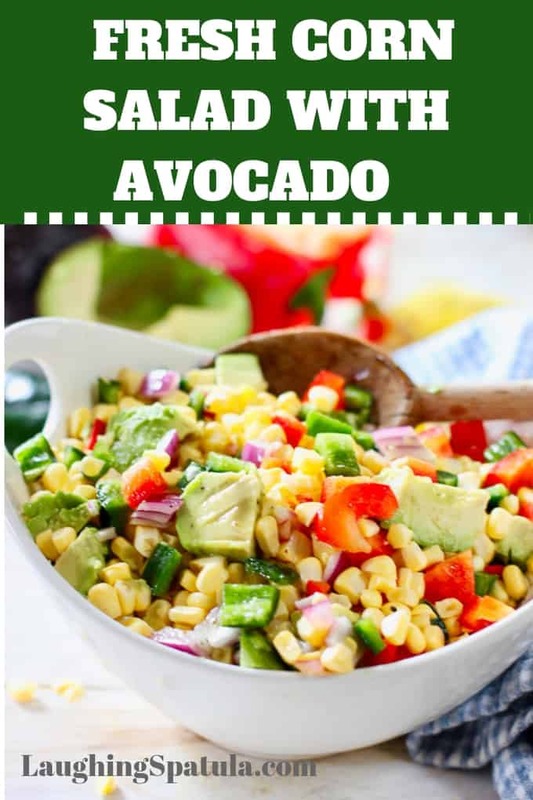 If you love the crunch of fresh corn you are going to love this salad! It’s surprising how delicious corn is when left untouched! 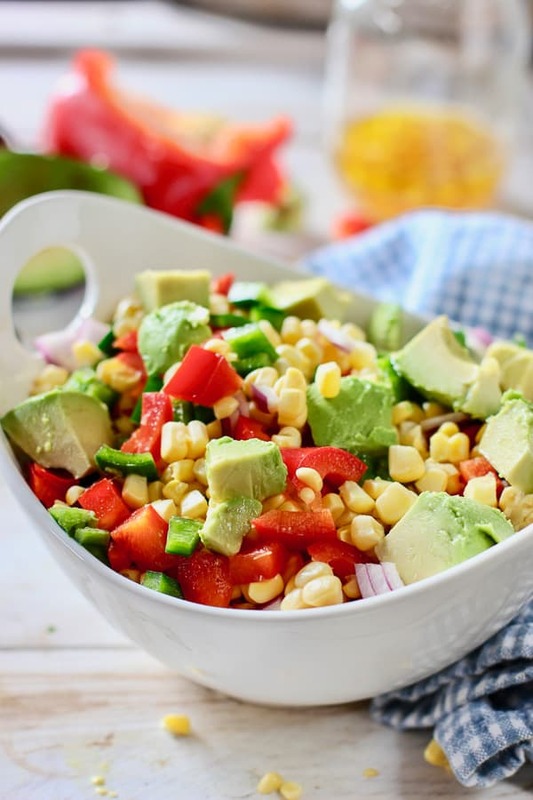 WHY WE LOVE THIS FRESH CORN SALAD WITH AVOCADO! 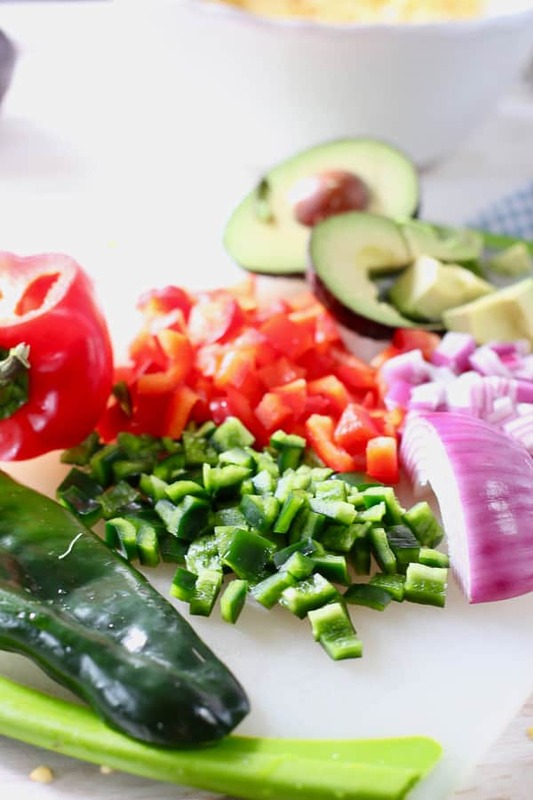 We love the addition of a poblano pepper to this salad! If you haven’t tried these beauties yet, this is a great recipe to give it a go! It is our new favorite veggie! If you take out the seeds and veins, which is where the heat lives, you are left with something that has just a slight kick. Like a jacked up green pepper. But if you don’t want any heat, simply toss in a green bell pepper or do you need MORE heat? Make it a minced jalapeño! 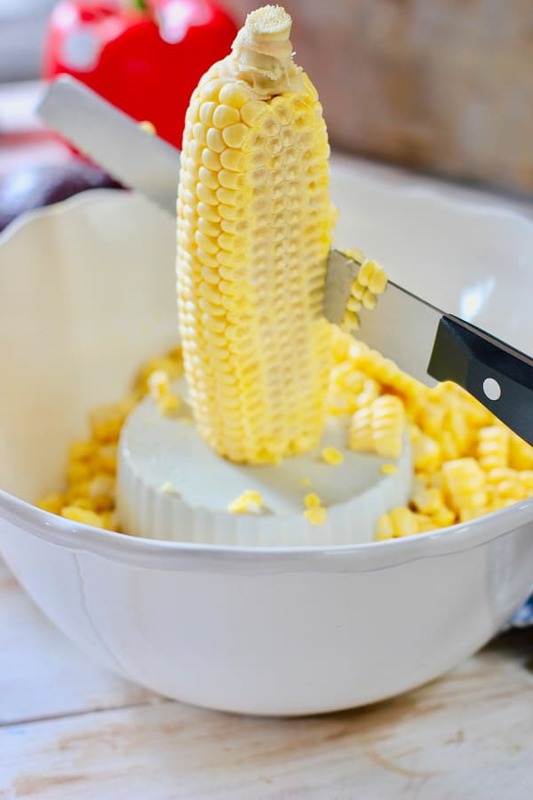 HOW TO REMOVE CORN FROM A COBB WITHOUT A MESS! Simply place a small bowl, like a ramekin, inside a large bowl. Place the flat end of your corn on top of the ramekin. Using your best serrated knife simply run it down the corn. No mess and everything is in the bowl where you need it to be! 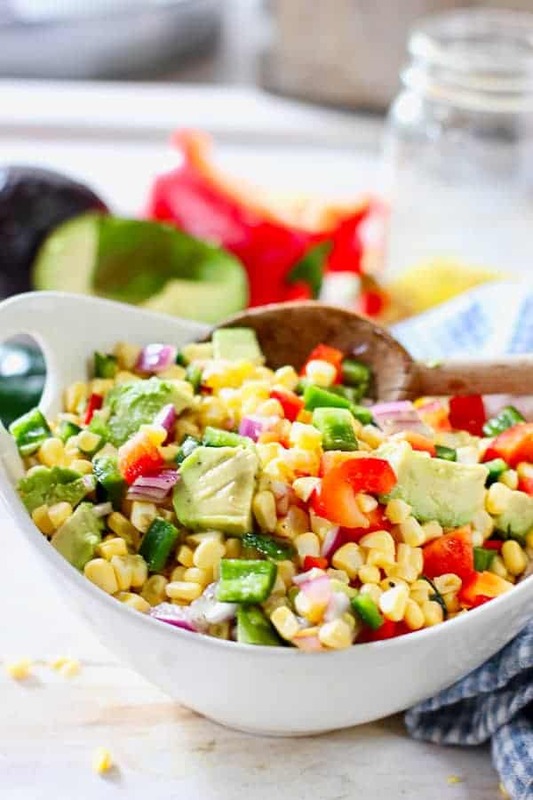 WHAT OTHER VEGGIES COULD WE STUFF INTO THIS CORN SALAD WITH AVOCADO? HOW TO MAKE HONEY LIME VINAIGRETTE! The beauty of the vinaigrette is it keeps your avocado’s green and your corn all crunchy. It tastes delicious and comes together in a couple minutes! Simply toss all the ingredients into a jar, shake, shake, shake and pour! You may not need all the dressing…it’s up to you! WHAT DO I SERVE WITH THIS CRUNCH CORN SALAD? We developed this recipe to go with our grilled Mahi! but it would grow great with our Sheet Pan Fajitas! To fresh and easy salads that go crunch! 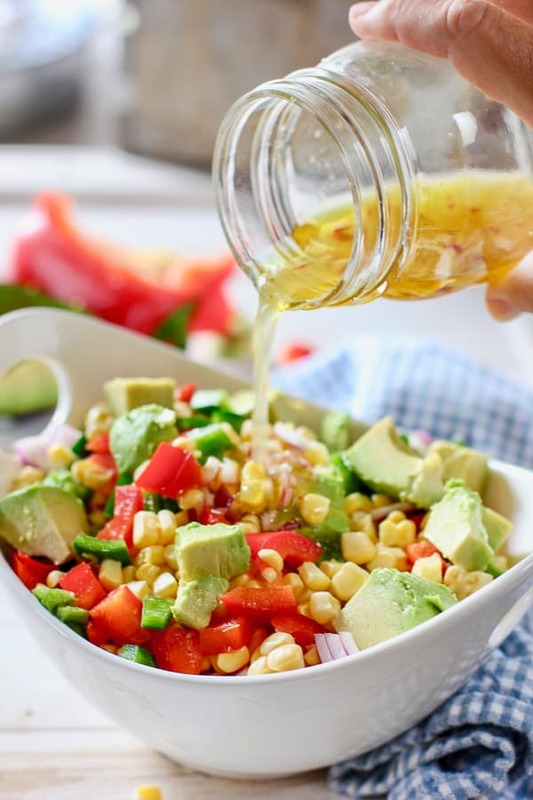 Fresh off the cob corn tossed with avocado and an easy to make Honey Lime Vinaigrette! In large bowl, add all salad ingredients. In small separate bowl or jar, whisk all vinaigrette ingredients. Toss corn salad with vinaigrette. You may not need all of the dressing, it's up to you! TASTE FOR SEASONING - more salt, pepper? If your corn is not as sweet as you would like, try adding a teaspoon of granulated white sugar. Hi there. A friend sent me this recipe as a side dish option for my upcoming wedding (October 6). We are doing a burrito bar. My question is: corn is out of season here. Would it be possible to use canned corn? I have 160 people to serve, so I obviously need to make A LOT!! Thank you!! 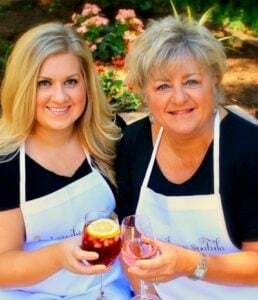 Hi Leah, I would suggest thawed frozen if you can’t find fresh but of course, fresh is better! Canned would be mushy :). Oh I didn’t even think about the mush! And idea how much corn four ears equates to?? The recipe does not say…do you cook the corn? does it go in raw? Hi Wanda – fresh uncooked corn. I added the word ‘uncooked’ to the recipe to make it more clear! Thanks for the note! This has become a favorite in our house! It’s so quick, pretty and totally mouthwatering. We took it on a picnic last weekend and ate it with some tortilla chips almost like a chunky salsa. Thank you! What a nice comment! Thank you for taking the time to write Kate! Love the freshness of this salad! I’d probably sub maple syrup for the honey, so need to try it! Would never think of using maple syrup! Hoping it comes out great for you! I think I could eat this every day for the rest of my life – yuuuum! I love that it’s so quick and easy to prepare too! Thanks for sharing. Thanks for the nice comment Sarah! Trick is to get really good sweet corn (or just cheat and add a little sugar :). It goes with most all grilled food really well! Thanks for your comment! Absolutely fresh recipe for summer. Love peppers. Thanks Dahn! I was just checking out your side the other day for picked red onions! Thank you Emma! I hope you get a chance to try it! This is my kind of salad! Fresh, delicious and no heat needed during the hot summer! Love the Lime Honey dressing too. Pinned! Thanks for your note Susan! Hope you get a chance to give it a try!